“Jujube” got her nickname because she has one green eye and one blue. She’s a moderately popular girl at school—fifteen, sweet and friendly. She lives with her mom and has her friend Sophie and Sophie’s mom living at her house because Sophie’s abusive dad has just gotten out of jail. So—while taking in Sophie might be more than average kindness, Jujube is pretty much an average girl. But she has more than an average crush on Brent. When he asks her to the dance, she learns about his reputation as ‘Mr. Warp Speed.’ What she doesn’t realize is how her own reputation will be destroyed after a few minutes alone with him in his car. Jujube learns about the ruined reputations of other girls on campus and what they have endured as she is now enduring the same name-calling and disrespect. But unlike anyone before her, Jujube has a plan to help them all regain their self-esteem and power over their high school destiny. 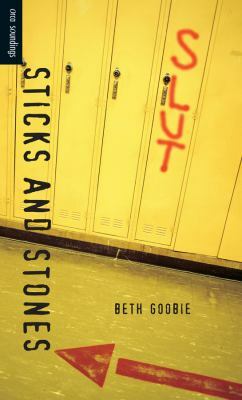 High school housekeeping: Sticks and Stones is for high school students who are struggling with reading or learning English. The Lexile level is 430, about grade 2 to 3. It does a good job of showing how a girl can become empowered when she refuses to accept the gossip swirling around her. This entry was posted in Family Problems, Fiction, Hi-Low/Quick Read, Read 180, Young Adult Literature and tagged gossip, hi-low reading, Read 180, reluctant readers, reputations, YA fiction, YA literature. Bookmark the permalink.